Stay tuned to http://polo67life.com/ for the reveal. Thanks to lora for letting us know first about this clue. I'm thinking at some point there will be a poster depicting "The Others" and "The Dharma Initiative" ... would seem to be in line with some of the other themes we've had. Though personally I'm still holding out for a "Drive Shaft: 2nd Tour of Finland" poster. Would go really well with the Locke's Secret movie poster. @Congested, LMAO. That would be a brilliant poster. ...just trying to look on the bright side. Comixguru just posted on her blog about her meeting with Damon tonight! I should've gone!!!!! @reAnimated: wouldn't it be? doubt it'll happen but if it did I'd buy it in a second. My last question to him was about the LOST print series. I asked him who came up with the idea- and he pointed to a woman standing next to me, Noreen. She quickly said- well, there was a group of us that came up with it. I asked her if she could divulge what the next print would be of- and she smiled and simply said, "I think you'll like it. It's one of my favorites." I tried pressing for more information, but all she would say is "Keep your eyes peeled tomorrow." Hmm.. 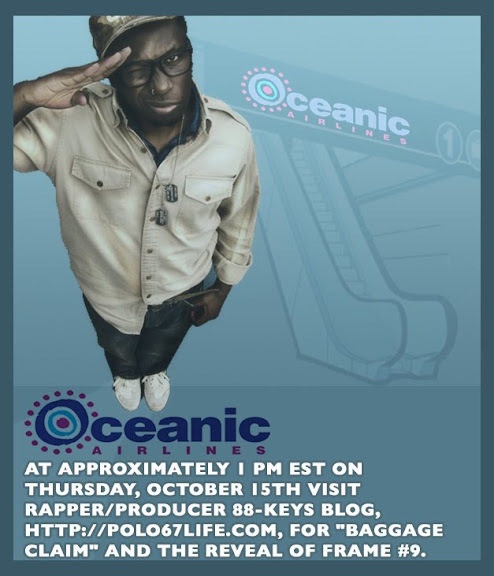 I wonder if the Oceanic signage and "baggage claim" is another clue to the the theme of the poster. I like the theory by Charles from the last post... that "Baggage Claim" will be a song with Lost references in it by 88-Keys. It'd be especially awesome if the URL was in the song if that's the case and he recorded it just for this. I am SOOOOO excited for tomorrow!! Especially after reading coixguru's blog and how the developer of the print idea answered her question!! I'll be in my only class of the day with credit card and laptop in hand!! Only 3 copies of "Methane Studios for The Dharma Van" glow-in-the-dark print available as of now! Get 'em while they're hot before it Sells Out! how can you tell theres only 3 left? 10 hrs and counting. time for some rest. nite. So do we know yet if its EST or EDT? Just for those of us getting up in the middle of the night! An extra hour of sleep could make all the difference! Just in case anyone is having trouble with the time zone, I've updated the main blog post with some clocks. It appears most places are still on daylight savings, so my guess is that DCAAPB is just referring to the time in eastern USA. Thank you so much for the Adelaide clock :). Although I'm not looking forward to getting up at 3:30AM for the reveal though! So it's 6pm in the UK then. Should be alright with that, I just finish work. Better not be any customers lurking at the back come closing time or I'll be annoyed. I think I'll let the URL hit the fan before creating a MOTU post. Too much info in one day ! I'm going to leave work a little early today today to make sure I'm sat at a computer for the reveal. Whew caught up with the comments. As far as the EST EDT maybe the person posting thinks EST stands for eastern I did when I was little. Also it's annoying that they've changed it from when it starts and ends. Do they really think it's saving energy. My lights are on from the time I get up to the time I go to bed not what what time of year it is. It was originally started for the farmers. That should be no matter what time of year. Also now the trick or treaters have to go out in the dark because DST use to start before Halloween. Ok OT rant over. This will make the second non event reveal. But the did say part of them could be vurtual. See ya all at 1:00 eastern!! The reason it changes in the UK is usually given as it is safer for children to walk to school in the lighter mornings when the clocks change. There are also schemes proposed to make the time change two hours for the UK and make that a permanent change. Not one I'm in favour of. By the way to clarify my comment in the previous post last night I got woken up by a scratching noise, which was coming from the wall. The cat was very interested in a small hole in the corner of the room. A mouse had got intothe wall, but couldn't get out because of the cat so it was tryng to scratch it's way through the wall. Anyway if anyone has seen the film Mousehunt, they know what came next. maybe the song will somehow contain the URL, like if it references a quote from the show. Ted that would be cool. So are we thinking audio or video on the blog today? I'm guessing video. It could just be a post I guess. Morning all. Sun is not up here in the Midwest. Rainy. I will try and screen cap as the video is playing. Have nice app for that. So thinking about claiming baggage . . . will this print be about daddy issues, Claire looking for hairbrush, Sawyer's stash. None are watercooler moments. Maybe it'a word that rhymes with baggage . . .oh, there aren't any. Top choices: Others Taking Walt, Michael Kills Anna/Libby, Charlie dies (again), Bloop, Desmond's Constant, Locke in Coffin, Frozen Donkey Wheel/Ben, the Black Rock (my personal favorite). Good luck to all today. Direct message me on Twitter Lottery_Ticket if you need poster buddy. The Dharma Van doesn't glow in the dark. I own one. Only 3 left huh? I'm glad it's going to sell out. It's a really nice print. Cloudy/rainy here in NYC, too. Glad we're getting a poster today. I need some cheer!!!! Hi Argies! Good work everyone, you never cease to impress me. 2) I hear ya Anonymous, are we going to assume that they mean EDT? I guess we should just be on the ready, it's only an hour's diff. Looking forward to today's interaction with Argies worldwide! Even tho I mostly lurk for this one, I do enjoy reading everyone's comments. Not here in my area. DST isn't until after Halloween now. It use to be before. Trick or Treat here is 6-8 pm So before when the time "fell" back it would be "like" 5-7 pm and it would still be light out and just getting dark at the end of trick or treat. Now it's dark when they start and even darker when it ends. Heheh, today's National Grouch day. Yes! reveal day - so excited! I am going to have to stay late at work because I won't make it home in time. By the way is anyone interested in talking in a chat room about the reveal today ? Congested has been very kind in setting up an IRC channel for us and I've created a very basic Lost ARGs Chat website. It would give us a more immediate feedback, but I don't want to make anyone feel left out if they can't access it from work or on a mobile device. I'll be heading to the chatroom. Sounds like a great plan. Chat sound good, Zort, but I am not allowed use the computer for anything other than entering the code! Don't worry, I'll be manning the main post and comments as well. To Sayids and Anon: the Dharma Van does not glow in the dark but it *does* have cool blacklight-effects(with hidden imagery -cool!). I've never been part of a chat. The how to register your nic and how to hide your ip is already to confusing so I'll just hang out here. echo echo echo I have a feeling I'll be all alone. Have a good time everyone. Morning all! Everyone limbering up their fingers? Let's get this party started! @sayid's girl - You're not alone. The chatroom has become a little too busy for me. Will also be hanging here. I can hang with you out here in the cold! 33 people in there already! Here's what I'm confused about. The FAQ's say the register your nick enter comand /msg nickserv register enterpasswordhere enteremailhere then follow the instructions sent by email. On the page where it says Welcom to LostARGs Chat choose a nick name? Or do I enter my nick name and go to the chat and enter this command somewhere there? It's just 'Choose a nickname' and then the connect-button… then you're in. I'll be here with ya too Sayidsgirl! LT yeah I know I can do that, but it still doesn't answer my qestiion on how to register my nick name with the commands provided in the faqs. I also don't know where to enter the commands for hiding your ip. I've never used a chat before other than at talkshoe and it's simple. Sorry I'm so dense. The air is much better out here! LT Yeah I know I don't need the chat for the reveal. I just like the one liners that pile up as the reveal gets closer. I'll just stay here talk to capcom and whoever else that shows up. I'm sure there's a few people who can't get into the chat from work. Hi all, back from work now, I've created a brand new blank(ish) post for the reveal. More than two is too many for me to keep track of! Does anyone think this poster will be like Dan's other posters that contain a hidden design when you turn the lights off?